It’s one thing to not cry over spilled milk, but it’s an entirely different scenario to hold back tears when a full glass of red wine leaves its mark on your white carpet! 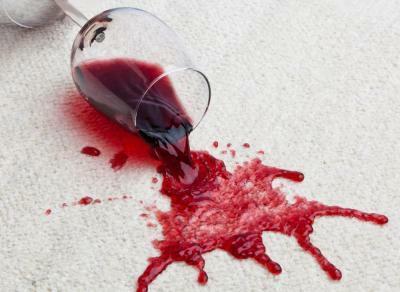 What can you do to remove red wine stains from your carpet, area rugs or clothing? Depending on what you have on hand, you can "MacGyver" a wine stain removal solution based on what you have available. An arsenal of everyday red wine stain removers include: hydrogen peroxide, baking soda, soda ash, vinegar, club soda, salt, white wine, Scotchgard’s Oxy Carpet Cleaner and a must-have product called "Wineaway". When red wine hits a white shirt, table cloth or light colored carpet, try to blot up as much of the wine as possible and then spray hydrogen peroxide on the stain, followed by a hefty sprinkle of baking soda. Make sure that the peroxide and soda fully cover the stained area and let it sit for 2-3 minutes. Then rinse with water and if it's a shirt or table cloth pop it in the laundry as usual. This method and the product, "Wine Away" are my silver bullets for quickly and completely removing red wine stains. Club soda can be poured on the stain and the carbonation will help to lift the stain from the carpet fibers while the salt acts as a buffer to keep the stain from setting. Vinegar does a nice job of neutralizing the purple pigments and can be combined with the stain-fighting force of either soap or soda. I apply laundry soap or washing soda directly over the vinegar and give it a few minutes to soak in, then rinse and wash.
Salt for Wine Stains - Who Knew? Wine Away has been tested and recommended by the Good Housekeeping Institute and is even endorsed by Gourmet magazine. It is truly a wine world wonder that every red wine lover should have stowed in their cleaning cabinet. I even keep their travel size in my suitcase, just in case. There are several solid methods for removing red wine stains that have worked well in a pinch, see which one works well for you. Just remember, whatever you do, don't let the spill sit for long before taking action, the longer it sits the more difficult it will be to lift the stain from your carpet or clothing.